Note: this is an account of the Paul Miller trial’s afternoon session on Wednesday. For the account of the morning session, go here. 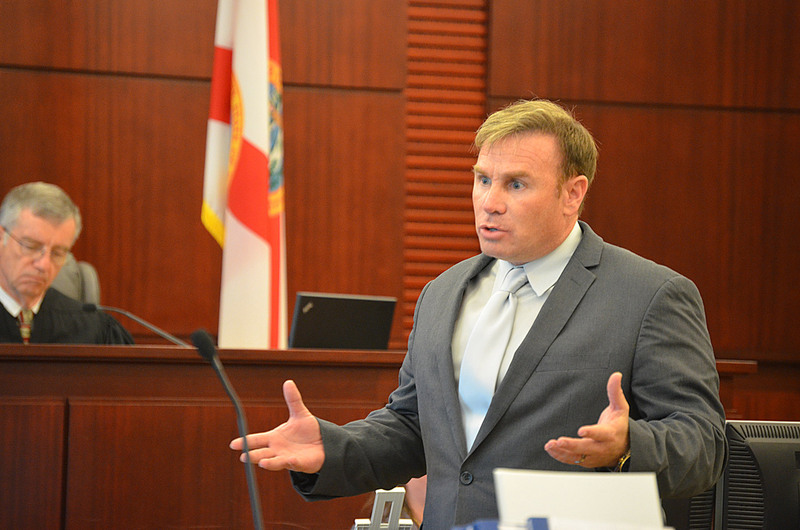 If it was sympathy that Paul Miller was trying to elicit from the jury Wednesday afternoon, his nearly two-hour performance was not a model. He may have hurt his case more than he helped it when he elected to take the stand in his defense in his trial for the killing of Dana Mulhall in March 2012. Miller made no secret of how much Assistant State Attorney Jacquelyn Roys was getting on his nerves, too, as he was in turn condescending, dismissive, impatient, ridiculing and irritated with a line of questioning that repeatedly had him explaining inconsistencies between statements he’d given police and statements he was making today, and as he refused to lend credence–as was his right–to the prosecutor’s version of events. But it was clear that Miller is not a man who suffers being challenged, let alone challenged by a woman. It was just as clear that if empathy is among the elements that play into a jury’s decision, he did not secure it. And if consistency between statements helps provides a degree of certainty about his version of events, he did not provide it. “I shot the man because I didn’t want him to shoot me and that’s about all there is to it,” Miller said. ‘There’s a lot more to it, Mr. Miller, because you shot an unarmed man—” Roys began to say. “I ain’t going to sit here and argue with you because I don’t think that’s—right. 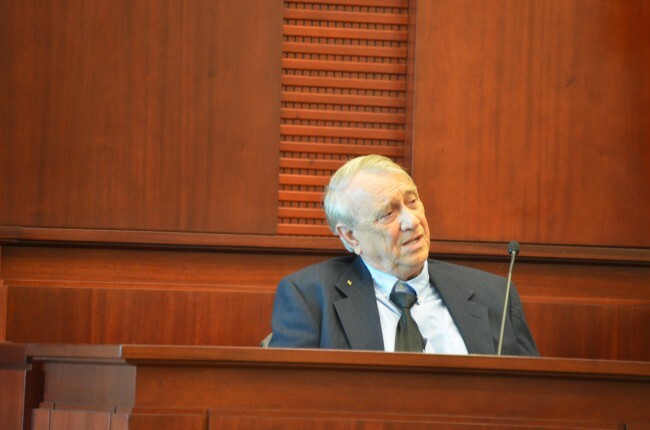 Do you, your honor?” Miller said, looking at Circuit Judge J. David Walsh. Williams called Miller’s wife to the stand, Derrol Miller, who spoke of his ailments and inability to walk fast or for long durations (the couple never take walks together). He cannot work in the yard for more than five to 10 minutes without taking a break. Derrol described the extent to which she went to ensure that her dogs would stop barking after the January incident, trying one type of collar after another and deciding that between the collars’ ineffectiveness or cruelty, she and Paul decided to remove them and simply make sure that one of them would be with the dogs at all time. They also installed the sort of curtain that blocked all view from Mulhall’s property. One minor surprise of the day was the defense calling up one of the three young boys who’d witnessed the beginning of the confrontation on March 14. The prosecution had called up one of the three on Tuesday, and he’d testified that he saw Miller show Mulhall the finger. On Wednesday, a different boy, now 12, was supposed to testify that, as he’d said in previous interviews, he’d heard Miller not yell but tell Mulhall to come down, that the two could “work it out,” and that there were children present. The testimony would have lent credence to Miller’s reasonableness. The defense was broadsided. 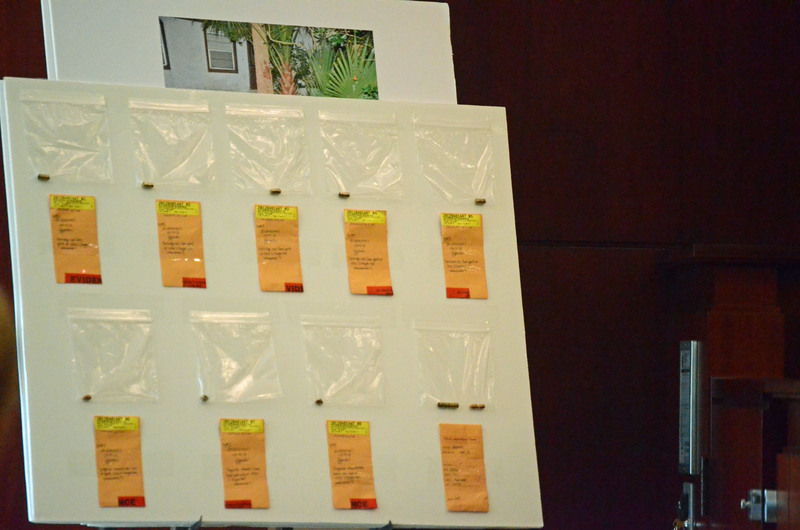 Williams tried to introduce answers the boy had made in previous interviews with authorities. That drew an objection, because there are specific ways those elements can be introduced. The jury was sent out. The prosecution and the defense argued before the judge. They finally agreed that the material could be used to “refresh” the boy’s memory. The boy sat through the exchanges in the witness stand. It was not the smokeless gun Williams was looking for. When the prosecution’s Hathaway took over the questioning, she craftily led the young witness to say “yes” and offer other forms of admissions–without a single objection from Williams–that he really hadn’t been paying attention to the two men arguing, he was with his two other friends, he was minding his dog, the chatter about school, the laughter Hathaway imagined (but the boy did not quite confirm). When Hathaway was done, the boy’s testimony was a wash. Deroll Miller followed, then Paul, who walked slowly from the defense table to the witness stand and sat, his blue tie’s knot not quite even with the collar. When Williams asked him how he felt over the incident, Miller, who alternated between saying he couldn’t admit to being scared and describing himself as such, said: “I hate to admit I was afraid of somebody but I was.” As Williams questioned him, Miller sounded like any older neighbor suddenly out-upon by a disturbing situation. He described his ailments from a life of hard work. He described the early days with Mulhal when he and his wife had taken him a plate of food at the first Thanksgiving they were neighbors. And he described the two confrontations the had with Mulhall, the last one proving fatal to Mulhall. “His face and his neck, red, I’d never seen a man so red in my life, he had a sneer on his face,” Miller said of Mulhall in the 30 to 45 seconds that he said the confrontation took, leading up to the shots. Miller he was afraid Mulhall was going to “come through” the fence (though Mulhall had stopped shaking the fence when Miller told him to). Then he described the shooting. But Miller said he’d never let on that he himself had a gun, never told Mulhall that he had a gun, never showed it, and throughout the brief confrontation, had kept his right hand, his shooting hand, behind his back, near his gun. He never explained–and the prosecution never got him to explain–how it was that Mulhall told him that he had a gun too, despite not knowing that Miller had one. “But the whole time you kept your hand behind your back, the whole time,” Williams said. “Until you fired, correct?” Williams asked, after the judge overruled an objection from the prosecution, which though the question was leading the witness. “That’s the only way I can fire was take it out of my pocket,” Miller said, with a hint of sarcasm even when questioned by his own attorney. “When you were sitting there, and he pulled a gun, or you thought he had a gun, why didn’t you go inside and call 911?” Williams asked. Williams’s time with Miller was relatively brief: he asked Miller about his interviews with police, where he slept the first night after the shooting (in his own bed: he was arrested the next day), the length of his police interviews, and their tone, which Miller said he did not like because investigators sounded like they were out to get him, asking the same questions over and over (“just like you’re doing now,” he’d later tell Roys). Williams was trying to show that the evening of the shooting, when Miller was interviewed until midnight, he was under duress, and may have given conflicting statements because he’d gone without a meal for many hours. “Probably would have never pulled mine out. He’d still be alive,” Miller said. The came the prosecution’s turn, and the mood soured almost immediately. That was expected: a defendant under examination by the prosecution is never a breeze. But as Miller jousted with Roys, the assistant state attorney, he appeared to have lost sight of his real audience: the jury to his right, in whose direction he almost never looked. Roys never got the answers she wanted, but in some regards, she didn’t have to, and probably knew it as she stretched the cross-examination to agonizing lengths. Roys began the aggressive questioning immediately, getting Miller to concede that he was the one who initiated the January confrontation with Mulhall since he walked out of his home to tell his neighbor that his dogs hadn’t been barking that long. She also got him to concede that between the January confrontation and the March, he and Mulhall had had no interaction at all, and no incidents had taken place in the interim. Nevertheless, Miller said he was afraid. Roys then moved on to the March confrontation and tried, through innumerable avenues, to reconstruct the moments that led to the shooting. Miller agreed that he was initially in his garage, getting ready to go fishing the next day. He heard Mulhall yell about the dogs, but did not confront him at that point. Mulhall went back to his house and slammed the door. At that point, Miller–who did note that he’d gone to the porch, when the dogs stopped barking–of his own admission, then went into his house, retrieved the 9 mm gun, and walked back to his porch. He set the gun on a table there and got ready to sit down when he heard Mulhall come out again, just as the dogs started barking again. Mulhall grabbed the fence and shook it. It was at that point that Miller walked out and confronted him, telling him to quit shaking the fence. 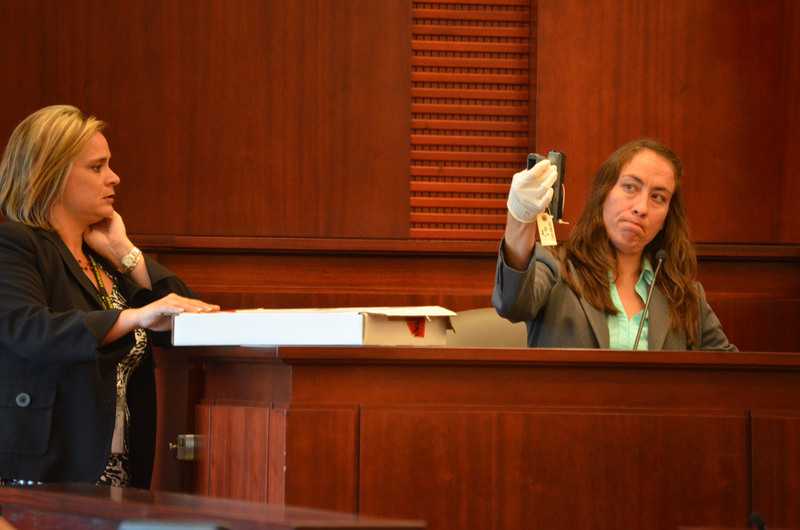 Maria Pagan, a crime lab analyst with the Florida Department of Law Enforcement, hoisted the 9 mm semi-automatic Paul Miller used to fire five bullets at Dana Mulhall. Assistant State Attorney Jacquelyn Ros is to the left. Click on the image for larger view. “It never entered my mind to call 911,” Miller said, because he felt threatened. “You wanted to kill him,” Roys said, referring to Mulhall. On several occasions Roys, who read generous portions of Miller’s words in police interviews, pointed out contradictions between his testimony Wednesday and what he’d said after the shooting. Among the inconsistencies: Miller had told Flagler Beach police that Mulhall had let go of the fence entirely, but Wednesday he said Mulhall kept hold of the fence with one hand (the difference being significant: if Mulhall had let go of the fence entirely, it would have suggested that he was already moving away from Miller.) Asked to explain the discrepancy, Miller said of the investigator who interviewed him: “He got me all worked up,” and compared the investigator’s tactics to Roys’s, and once called her a “smart aleck.” He was not helping himself by essentially saying that he does get worked up, extraordinary though the circumstances were. But she finally got him to concede explicitly that he, Miller, had confronted Mulhall with a loaded firearm. “Yes. Yes,” Miller shot into the microphone. When Roys was done with Miller, Williams asked him a few more questions, starting with his state of mind the evening of the confrontation (“terrified. I was afraid I was going to get shot”). He then asked curious questions about accents and other people’s English. Williams alluded to Miller’s difficulties understanding certain American dialects better than others–that is, southern dialects (like Williams’s) better than northern ones. “Because you’re not screaming and shouting and using that accusing attitude like her and Brendel,” Miller said, referring to one of the investigators who’d interviewed him. But that wasn’t quite the answer Williams was looking for. “My voice, my dialect,” Williams specified. “Yeah, where is he from?” Williams specified. “You feel he was pretty rude to you?” Williams asked. “I have nothing further,” Williams said. Mulhall, of course, is originally from “way up north”–Maine, where he was buried. The day ended on that implicit, almost bigoted dig at loud, rude Northerners, at the close of an afternoon when speaking ill of the dead, however defenseless, was central to the defense’s strategy of fostering reasonable doubt about the second-degree murder charge Miller is fighting. The trial resumes at 9:30 Thursday morning. It is expected to be turned over to the jury by day’s end, or by Friday morning. Shell casings in the upper row and bullets recovered from the crime scene, as displayed to witnesses and the jury in Paul Miller’s trial. Click on the image for larger view. I think his testimony and attitude says it all! Sick sick sick! Let me get this correct here, and I will attempt to use proper English and not my Southern drawl accent as to not confuse anyone. Any person who had just fired a gun at someone and possibly killed them, would still be standing there with the gun in their hand or would have dropped it on the ground beside them, quite possibly in disbelief. Mr. Miller, instead, went inside to retrieve his firearm and placed it on a table on his porch. Upon hearing Mulhall open and slam his door, Miller picked up his weapon and placed it behind his back. After firing five shots at a man from 10-12 feet away, on the other side of a fence no less, Mr. Miller calmly went back inside and put the weapon back in it’s box and placed it on top of the cabinet, then proceeded to go back outside and call 911 and confess to the shooting using profanity. In my honest opinion, there is absolutely no amount of remorse or fear or anything other than premeditation in Mr. Miller’s mind immediately prior to, during, or immediately following the shooting. He basically said under oath, that he did not care if he had a gun, he was not going to get shot. Therefore he shot Mr. Mulhall before he could shoot him. So again, he basically confesses to cold and calculated murder on the witness stand through direct questions made by his own attorney. Mr. Miller is lucky he did not push the issue about his apparent hatred for people from “way up north somewhere”…….or else the State could have made this a possible hate crime! Enjoy the rest of your life in prison Mr. Miller. The bologna is deeee-lish! I hate drunks. I hate bars and businesses that sell alcohol ! They were at war for years. probably not a good thing to call out yankees since so much of flagler county is transplants anymore. Now to see if there is any evidence to prove the above is not true. Otherwise???? Seems to fit the law for self defense. This man obviously has a problem controlling his anger and impulses. He is obviously a danger to society when he can not even hide his aggression in a court room…towards a prosecutor. I wouldn’t want to be anywhere near this man, nor would I want to live in his neighborhood or have my children walk by his house or even go to the same church. My goodness if you step on his foot by accident he will spew out hatred and very possibly worse! As far as a war for years…I have seen/heard/read no evidence. They had an argument once before this and from this man’s attitude I would say that he was MORE at fault for the escalation of the dispute. Normal people would apologize and bring the dogs in for a bit. Not shoot. Good Lord. This man is CRAZY! Prison or an insane hospital, makes no difference as long as he is out of society! Nothing new, as once more I see a Flagler County male judge undermining a woman even when she is the Assistant Prosecutor and the accused is disrespecting her with his aggressive attitude and words!